This topic contains 6 replies, has 2 voices, and was last updated by DaviesChiropractic 5 days, 7 hours ago. I’ve set up the coupon code option with the stripe payment plugin. 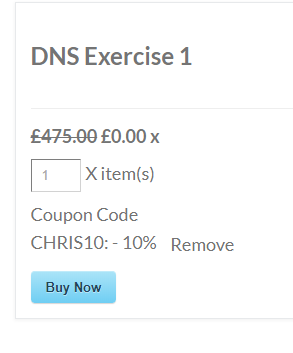 But when I come to use the coupon code on the front-end it shows the price as £0.00 following the strikethrough / crossed out main price. The discount value is correct when you come to pay, but it’s confusing for visitors to the site. Please could you advise on how to repair this issue? No problem, I’ll send it via the form now thanks. Hello, did you receive the contact form results through OK? Nope. Looks like email is getting filtered by the spam filter. I have figured out your website URL though by looking at your forum’s email. I will research this and get back to you with some info shortly. Yep, I was able to reproduce it on my test server. This is rare frontend bug that appears when custom quantity is enabled and initial quantity is set to 0. In order to fix it, edit your product and set initial quantity to 1 instead of 0 or empty value. Then update your product and visit payment page again. Discounted price should be displayed fine now. We will fix this issue so it won’t produce confusing results even when quantity is set to 0. Thank you for reporting this and helping to figure out why this is happening. Great thanks alexanderfoxc, it’s working OK now thanks with the tweaks to the initial quantity.